Too Cold for an Outdoor Fun? Talking Rocks Cavern has the Answer! If you are looking for a place to experience winter outdoor fun in Branson, head on to the Talking Rocks Cavern and enjoy nature and the warmth that you can feel inside the cave. Exploring the caves is one of the most exciting adventures to be experienced in the Ozarks. The cavern is considered a perfect destination for kids of all ages to enjoy the fun of exploring many fascinating things that they can find. If you think it’s impossible to enjoy winter outdoor fun in Branson, Talking Rocks Cavern will make it possible. Talking Rocks Cavern offer exciting activities and fun things to do which include Cave Tours, Cave Country mini-golf, Gemstone Mining or Sluicing, Speleo Boxes, and Nature Trails. 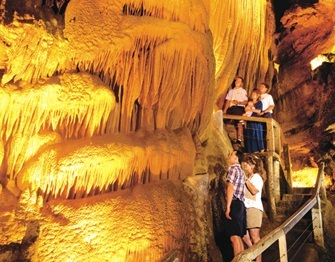 A one-hour long cave tour is offered with guided walking tour of Talking Rocks Cavern. This kind of tour is both awe inspiring and educational where you will see mineral deposits and learn about the discovery of the cave, as well as geological information about the cave. Another fun things to enjoy in the cavern is the Cave Country Mini-Golf where you start at the sinkhole (a.k.a. hole #1) and follow the mostly tree-shaded course to the 9th hole. Gemstone mining or sluicing is another fun and educational activity to do in the cavern. Start this fun thing by purchasing a bag of “mining trough” in the gift shop and head to the Sluicing area. Using sluicing troughs and screened sluice boxes, you will learn how to recognize semi-precious gems and other minerals. Discovering a treasure gives fun and excitement for everyone. SpeleoBox maze is an exciting activity to do where you will crawl along winding and twisting passages. This fun activity lets you learn caving techniques through wooden cave passages. Nature Trails is another exciting activity that you can do inside the cavern where walking on one of the four trails can be a wonderful way to experience nature up close. From the youngest hiker to the very experienced hiker, there’s always a trail for everyone to experience outdoors at its best. Talking Rocks Cavern is such a wonderful place to enjoy winter outdoor fun in Branson by way of exploring nature as well as enjoying exciting activities.